I was laying under my bike, battling a skid plate bolt that didn't want to thread. I patiently pulled it out, hand thread it again, and finally succeeded. I laid there for a second thinking about what I was doing. Securing the bolts on the skid plate is the last step in the oil change process. And out of no where a thought occurred to me, my mother would never have changed her own oil. A ridiculous thought, the only reason my mother would be in the basement would be to change out the laundry. My mother lived by a strict unyielding rules, rules that governed gender norms. In my mother's world, a woman would never wield a wrench. If a woman was seen pumping her gas, she was to be pitied that she did not have a man to do it for her. In addition to the rules, what other people though of her was also a top priority. I distinctly remember the mantra of "what will the neighbors think". One could assume it was childhood rebellion that led me to be so different than her. And perhaps there is some of that. But the unspoken lesson that I learned from her was the price she paid for her dependence. When my father passed away, 10 years before her, she did not know how to pay bills, or get her car serviced. Growing up I saw how she had to ask for money, and account for its spending. It was that more than any rebellion that became the tenant of my values, my independence and ability to take care of myself trumped all. As I wiped down my wrenches and put away my tool box, tossed the oily paper towels into the trash, I thought about writing this entry. Why do I write a blog at all? If for no other reason but to encourage that next woman who wants to learn how to change her own oil. Do it! Taking care of your own needs is the essence of self confidence. Enjoy!! Another thought provoking post on why blog… I haven't figured it out yet. But I think you stated a great reason. A rider should know at least how to service his/her own motorcycle....its part of the bond. Gender based roles and behaviors...things are changing but some remain the same don't they. But I'll also point out that lots of MEN don't change their own oil, can't lift their own fallen bikes, and pay mechanics to do things for them for any number of reasons. It is just that that circumstance doesn't seem to keep them from doing as they please. Nor should it. For any of us. Great point, about men not learning to do things for themselves either. Self sufficiency isn't always valued. Thanks for your insights. We often speak of the difference between doing something because we like to do it and doing something because we must do it. The freedom to make that shift is given to us by our role models, our society, and our own courage to be "different." Please keep being different. Great post. 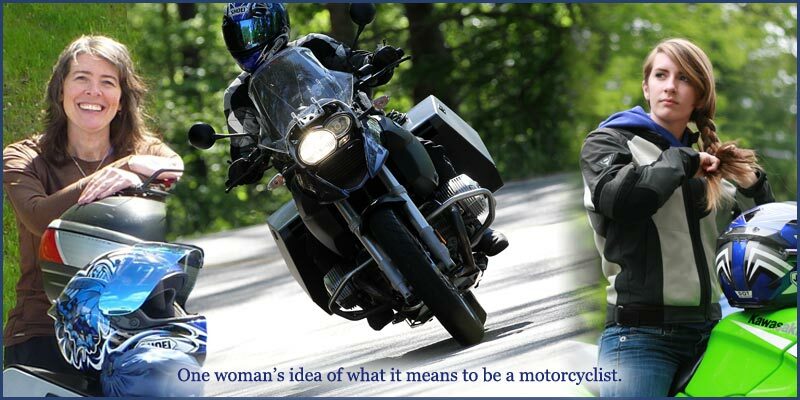 Male or Female there's no difference, a biker is a biker. If you've not spent time laying under your bike....try it for a different perspective! Also new to the BMW world, I picked up my new GSA June '13. Plan on doing all possible maintenance myself unless advised otherwise. And finally.....New to attempting to create a website/blog. You're probably a very busy person so please moderate anything I say. 14 months of researching blogs and building sites still has me at the drawing board. Your blog has been refreshing and I would use the template as is for my hopeful outlet of expression. Can you briefly advise me if it does not stall anything you have going. myhigh50adventure at yahoo is my primary contact, Google has me forced into bill.kearnes at gmail which may be what I have to use in the blog building. either works, any advice appreciated, and thank you for being so noticeable. 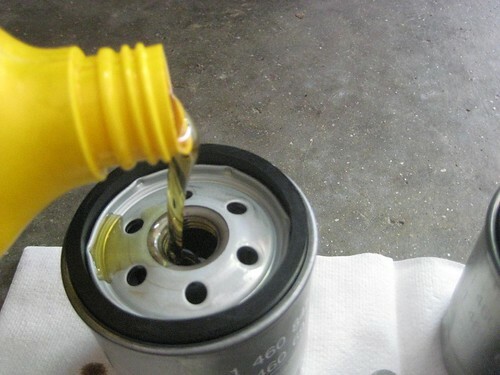 Doing my first oil change today, your greasy oily pictures from Nov 2011 are going to be my guide. I attempted to follow all your posts and subscribe, but it wouldn't let me. Again, only if it's not a problem. You do not have to post this on your page either, just seeking some mentorship.